Going forward through this article, I may very well sound like an 'old guy', which is rather true - I will be 50 in just a few short months. This is mentioned only to provide a brief context of my experience with the evolution of technology and change itself. I was born very far North (Arctic Circle north) at a time when cutting technology was chainsaws and the latest improvements in snowmobiles promised smoother / safer rides. When serving in the Armed Forces, I was one of the first to use an electric typewriter in my Battalion. Through my academic endeavours, I had witnessed the first computers (think floppys and diskettes) and did actually own a 'bag-phone' which plugged into the cigarette (now 'accessory') socket. 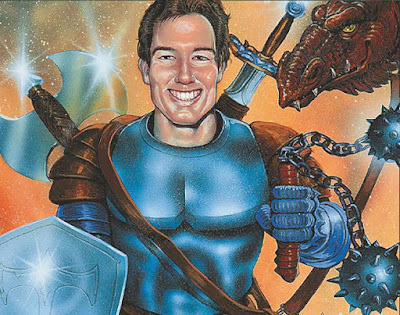 This is all mentioned to provide a sort of way-marker in my reading of the ever-evolving Magic: the Gathering site that Wizards of the Coast has been maintaining and improving over the years. 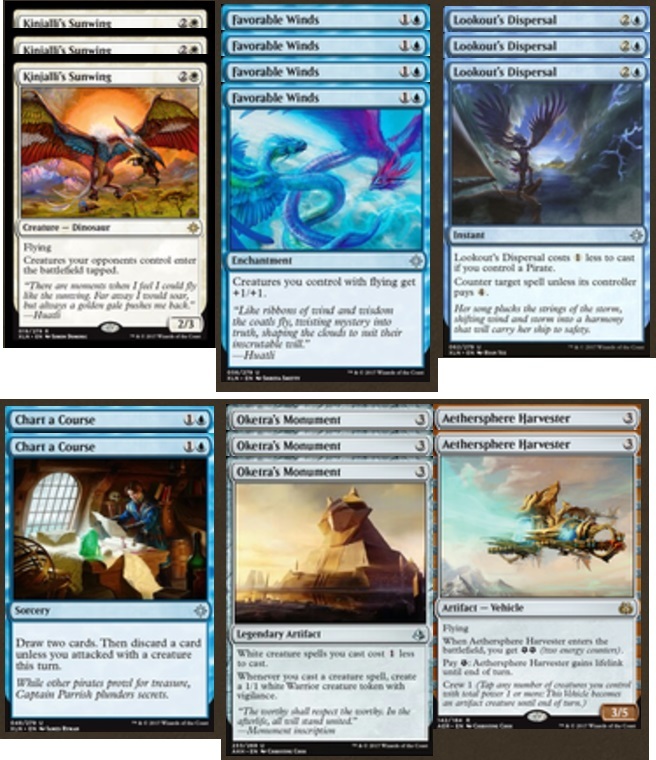 Today's article to MTG Realm is posted as a new iteration of the Daily MTG has now gone up. 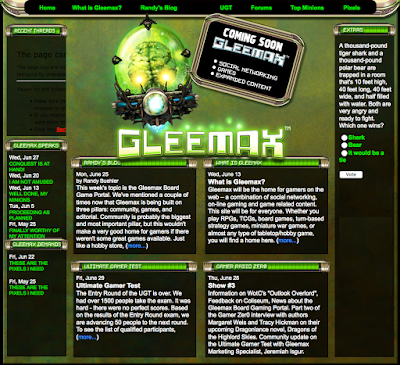 Here is a progression what the MTG webpage looked liked from when we first started reading it. Pure nostalgia. 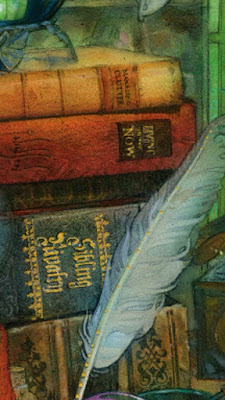 I had spent a lot of time reading Magic Arcana, as well as some authors, whose content may very well be considered 'racey' by today's standards. My 56k dial-up modem is now considered ancient technology. Look at all the graphics - enough to make one's self dizzy. Brian David-Marshall and Adrian Sullivan dispense strategy and wisdom for players. 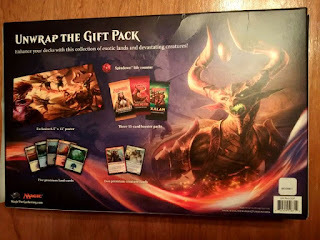 In 2007, Wizards of the Coast had addressed the rapidly growing fan community's desire to further engage on a more social level. Randy Buehler was the tip of this spear, but unfortunately, bad timing had these fans busy on Facebook and Myspace resulting in Gleemax closing a year later. By far, my favourite designs of the Daily MTG webpage. The newly improved gatherer is amazing, content is very well organised but By Odin!, should you need to search for something, you are going to have a bad time. Gatherer has a slick-look page which propels me in to a new level of deckbuilding. Gleemax 2.0 ? 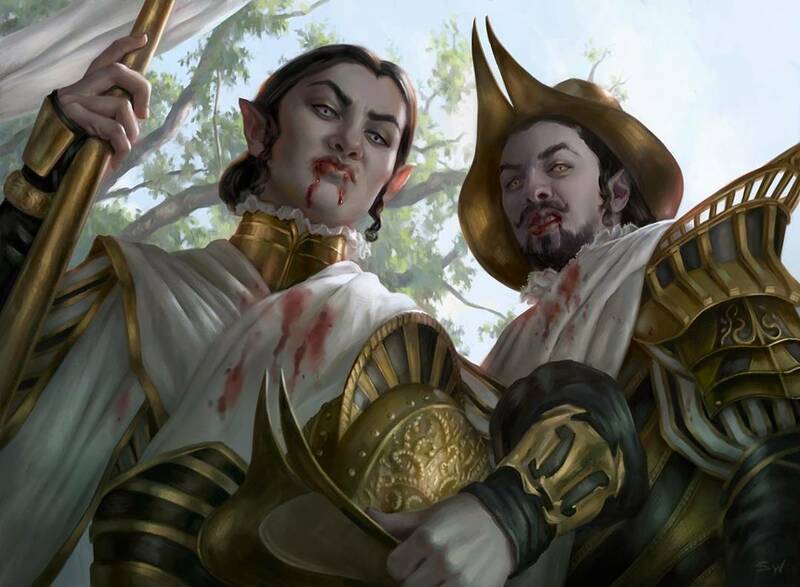 Wizards of the Coast concludes that Facebook and Myspace is a mess for the MTG fans to build a community with at this time. 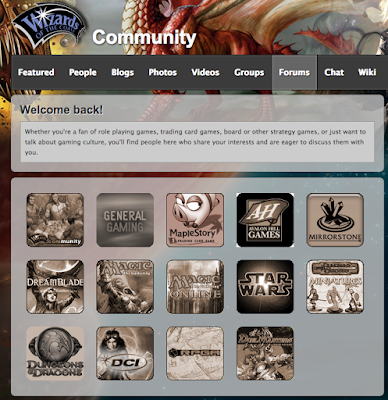 Wizards Community goes live circa 2010 which supplements the main webpage with this creation and I enthusiastically sign up. It closes down five years later which kinda left me sad. Oh dear, this was not to our liking at all. Let's just fast-forward a few months. This has become much more improved, and one is now able to use a functional search to float out that article you wanted to re-read. Navigation is decent and Magic Arcana continues to be a 'must read' column. Daily MTG 'Update' is soon to become a daily routine for me in 2016. Here comes the part where my 'old fogey' preface is now referenced. I am experiencing a mild dislike, but as Leo Buscaglia said - "Change is the end result of all true learning", which prompts me to realise that change is sometimes a good thing, so I look past my old-guy pre-determinations. I very much appreciate the community generated content section and know that I will come to like the re-design in rather short order - just not the 'daily mtg' font. Let's drop the probiotics please Wizards and ask Beleren to step back into the room. Hope all of our American cousins to the south had an enjoyable Thanksgiving holiday. 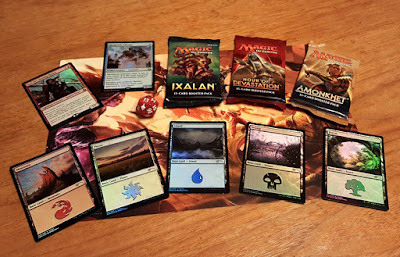 We had an opportunity over the weekend to not only play some standard, but some Commander and Modern as well. 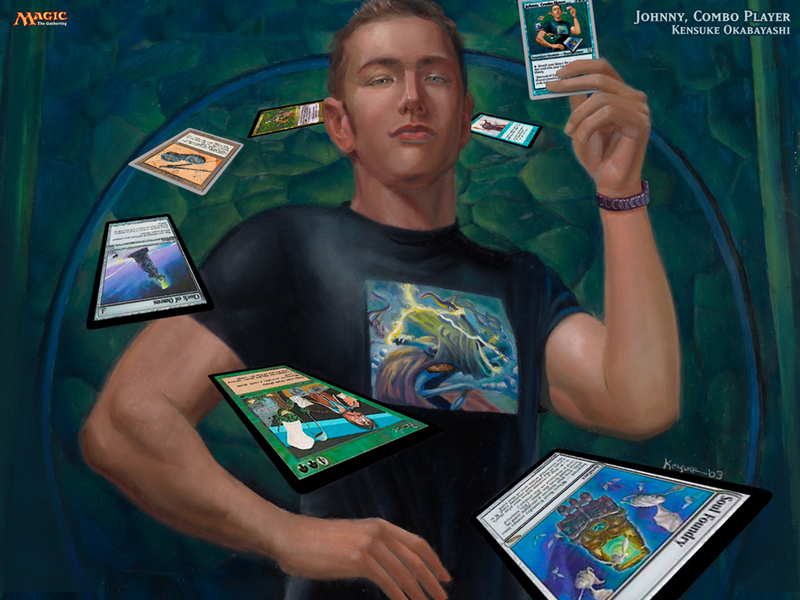 We had not dipped out toe into Modern for quite some while and really need to get a grip on the metagame of this Magic: the Gathering format. 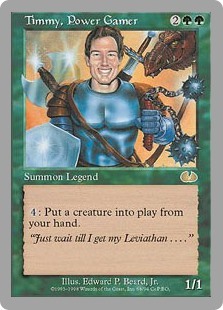 Today's post we do want to yatter a bit about Favorable Winds in Standard. We had an odd but fun decklist when we first saw this back in Avacyn Restored and with the reprint in Ixalan, nostalgia has us building around this card again. Why? Because one can only be entertained to a definitive point in standard with the mono-culture of Energy decklists. Perhaps we will get to a derpy build featuring Solemnity, but for now, let's take to the friendly skies with Air Azorious. This does not look entirely bad on paper and we do have all the cards, so we will likely build for the kitchen table. A one-drop Siren Stormtamer buys some measure of insurance against removal and Dreamcaller Siren spices things up with a Pirate sub-theme. 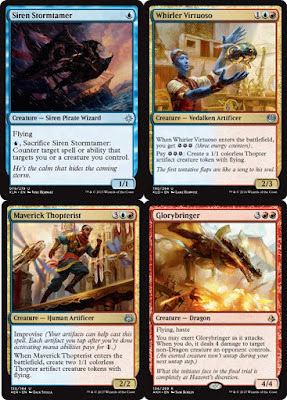 The others are pretty much flyers with value or a relevant ability - Cloudblazer is card draw advantage, Aerial Responder sweet lifelink, Kinjalli's Sunwing to tamper with tempo, and Aven Wind Guide which lends support to tokens created with Oketra's Monument. We would be rather happy to see a measure of token generation, grant the team flying and of course a pump with Favorable Winds. Anywhoos, looks fun which is fine with us as we are not expecting to take this to first place on a Pro Tour. With the much anticipated whacky fun 'Unstable' 'Un'-set being released December 9th, 2017, there is a whole lot of information to relish (no, it is a turn of phrase, not prepared pickle condiment). 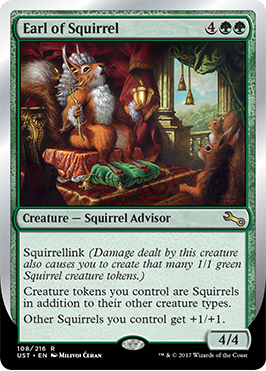 There are five feuding factions, contraptions to assemble, mangling of DNA with Host and Augment, a chittering gang of squirrels to contend with, and of course, the Bid Daddy of old-skool Planeswalkers, Urza himself. 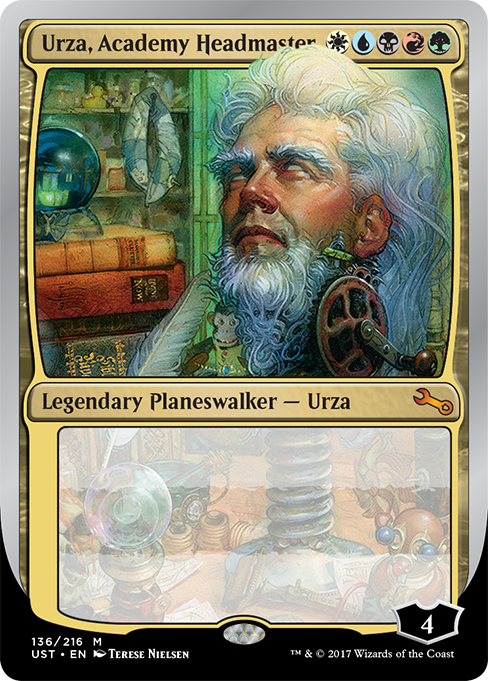 The card - Urza, Academy Headmaster, has been (almost) fully revealed, BUT there is a very cool catch. 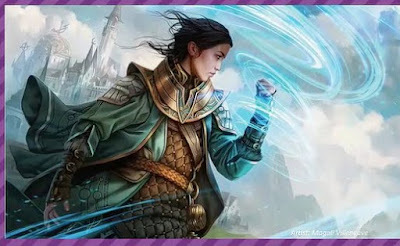 The three planeswalker abilities of +1 / -1 / -6 is to be just as random, fun and unpredictable as we expect the Unstable set to be. 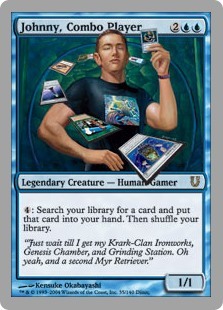 To determine just what the ability is when you cast this and in later turns activate Urza's abilities, one would drop on over to "AskUrza.com" and click away at the ability. For the moment, Urza is getting powered up when Unstable is released on December 8th, his head will be fully loaded to deliver a plethora of whimsical nonsense. For now, here is Magic: the Gathering nutter Mark Rosewater with some notes on this card. Other card specific notes may be found over at this linky. 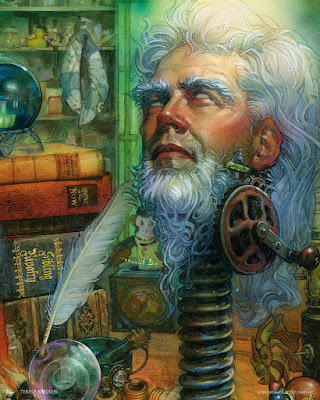 We are leaving off with the very awesome card illustration for Urza, Academy Headmaster from artist Terese Nielsen. Something rather odd happened early this morning with the Wizards of the Coast's Brazil community Twitter. 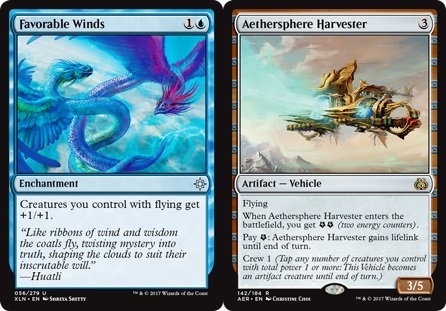 They had posted, very likely by mistake we think, two Rivals of Ixalan cards, which releases January 19, 2018. The post went up around 6:00 AM this morning (local EST) and was subsequently removed at around 10:00 AM. Do not fret, we did take a screen-capture of it. First card - the Immortal Sun, what every faction and tribe on Ixalan seems to be after at the moment. Spells you cast cost 1 (colourless) less to cast. The card's flavour ties in very nicely to the artifact's ability to prevent poor Mr. Angrath from returning to his home Plane to celebrate his daughter's birthdays. 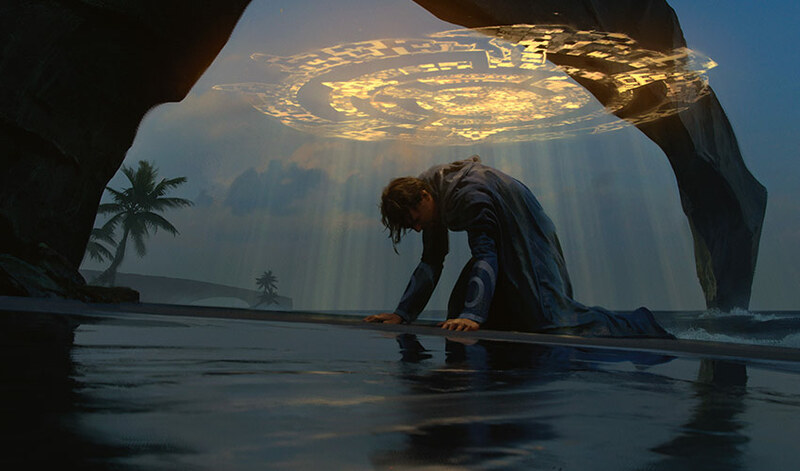 The card illustration from artist Kieran Yanner is lovely and is very close to the design of Ixalan's Binding (art from Chase Stone), which is though to act like one-way valve on the Plane of Ixalan where Planeswalkers can visit or 'check in', but never leave. 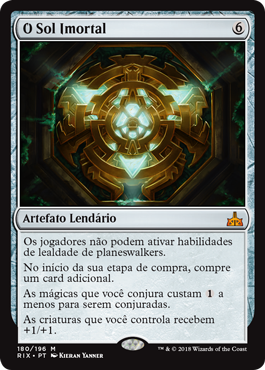 If there were ever an Infinity Stone in Magic: the Gathering, we suspect it would like like this. 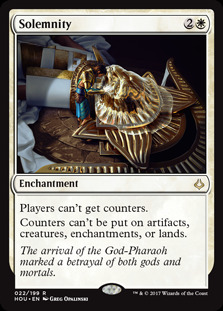 Hopefully Jace, Vraska, Angrath and other Planeswalkers are able to neutralise this relic and escape. If not, they will settle for the warm smell of colitas at Hotel California forever. 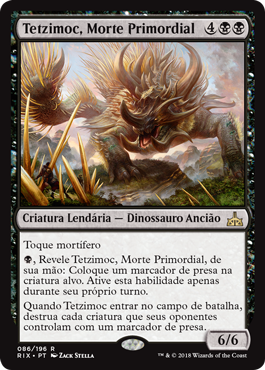 B, Reveal Tetzimoc from your hand: Put a prey counter on target creature. Only activate this ability during your turn. When Tetzimoc enters the battlefield destroy each creature with a prey counter on it. Artist Zack Stella created a wonderful piece here. Tetzimoc "Spike', Death Incarnate is able to start handing out 'prey counters' while building the mana to cast it. This reminds me of the 'Black Spot' in Robert Louis Stevenson's Treasure Island - we almost think that this may have been a Pirate (Brazen Coalition) card early in development. 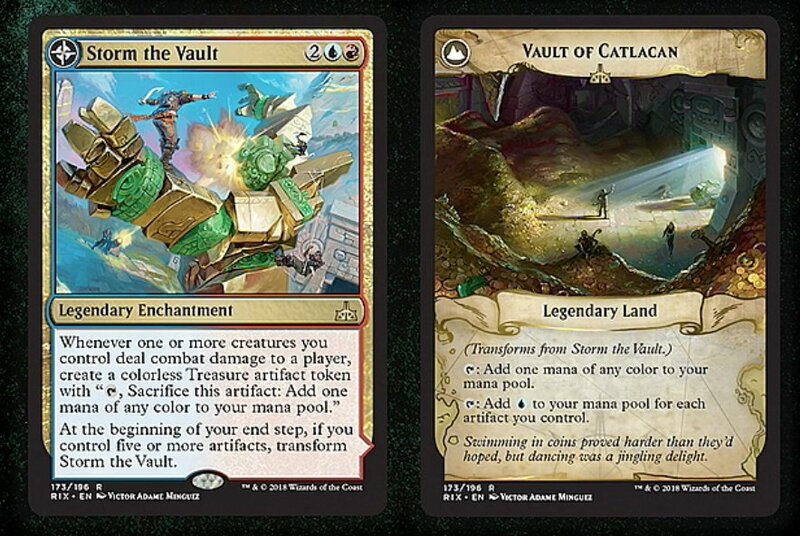 Catching up with one transform card earlier is Storm the Vault // Vault of Catlacan. 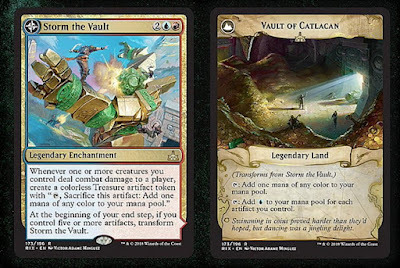 The card art from Victor Adame Minguez shows what appears to be Pirates taking down an elemental guardian and hitting pay-dirt in the form of a vault full of treature. 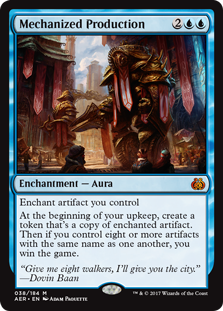 Speaking of the Treasure Tokens the vault may generate, we need to re-visit Aether Revolt's 'alternate win condition' in Mechanized Production, and see if we can create the right condition for a win condition. 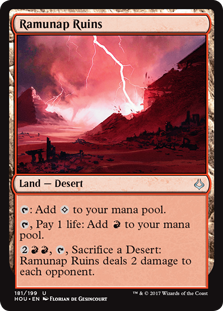 Whenever one or more creatures you control deal combat damage to a player, create a colorless Treasure artifact token with "T, Sacrifice this artifact: Add one mana of any color to your mana pool." Swimming in coins proved harder than they'd hoped, but dancing was a jingling delight. It is Friday and why not make it magic. Get thee to a Friday Night Magic event at a local gaming store. MTG Realm is attending OMG! Games, here in Barrie, Ontario and taking along one or more rogue decklists which, although designed to find vulnerabilities with the current meta-game, may simply fail to launch. 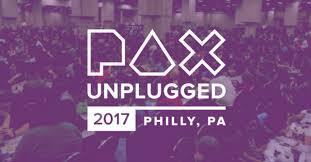 Anywhoos, some Magic: the Gathering news out today from PAX Unplugged taking place 17th to 19th November in Philadelphia. 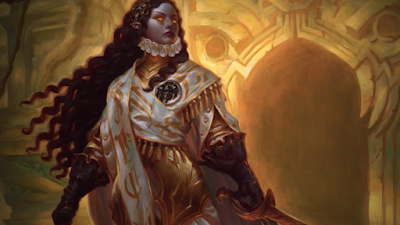 Here Wizards of the Coast was reported to preview four (4!) 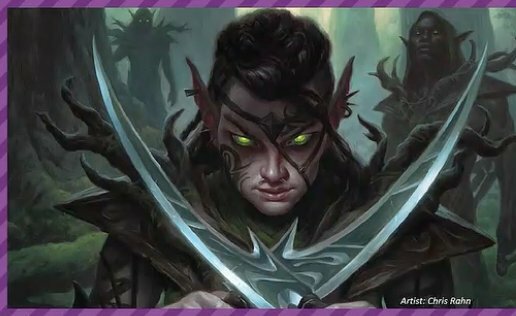 pieces of art from the upcoming set Dominaria, to be released in April, 2018. Understandably, there is a lot of player excitement and nostalgia for this, so it will not go unnoticed that any previews will be met with a level of raucousness. It is unclear at this time what each of these arts may be, but we have lent our our prognostications below. The fan community did indeed go wild over this one. 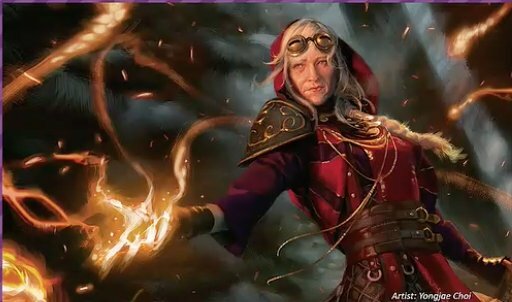 Thought to be Jaya (Ballard) by Yongjae Choi, who may have founded the fire mage academy on Regatha, where Chandra studied. 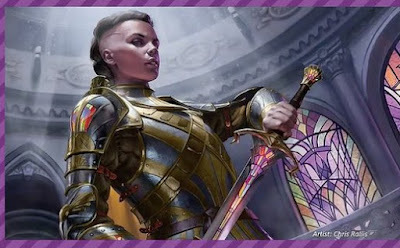 Linessa by Magali Villeneuve, possibly with the Academy on Tolaria West in the background. Some claim this may be Narset travelling to Dominaria. Absolutely gorgeous art here, and rather reminiscent of the Orzhov style on Ravnica. Thought to be a Benalish Knight, illustrated by Chris Rallis, possibly shown within the Angelfire Churche of Serra and Gabriel. Elf by Chris Rahn. We think a dark Elf (green / black), possibly an Elf of the Thelonite Order from Havenwood who had manipulated fungus and dark magic to create sentient Thallids. Viz Media had posted a video earlier today featuring ‘The Art of Magic: The Gathering - Ixalan’ chat with James Wyatt, Senior Creative Designed, Magic: the Gathering and Tyler Jacobson, a Magic: the Gathering Artist. 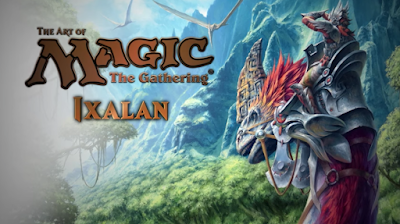 Viz Media and Magic: the Gathering is publishing ‘The Art of Magic: The Gathering - Ixalan’ Hardcover art book on January 2, 2018. 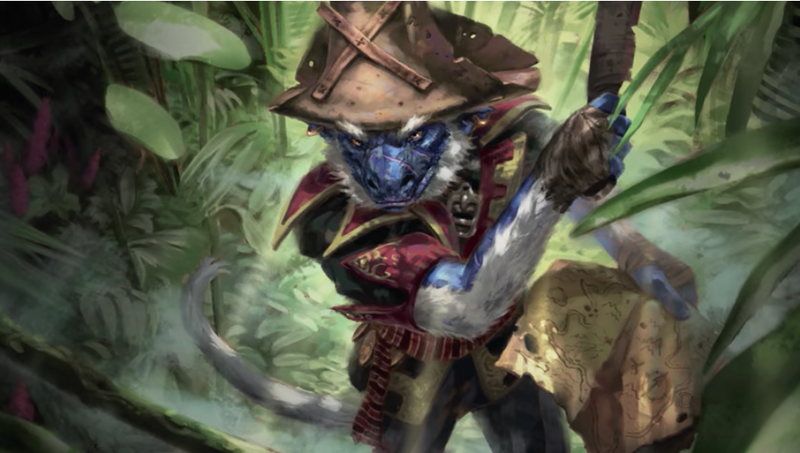 In the video, posted here, there are a few tantalizing sneak peaks of some art pieces we have not yet seen yet and may likely see printing in the next set, Rivals of Ixalan. The book may be purchased through Amazon at this link. For more information, pop on over to this link at Viz Media. 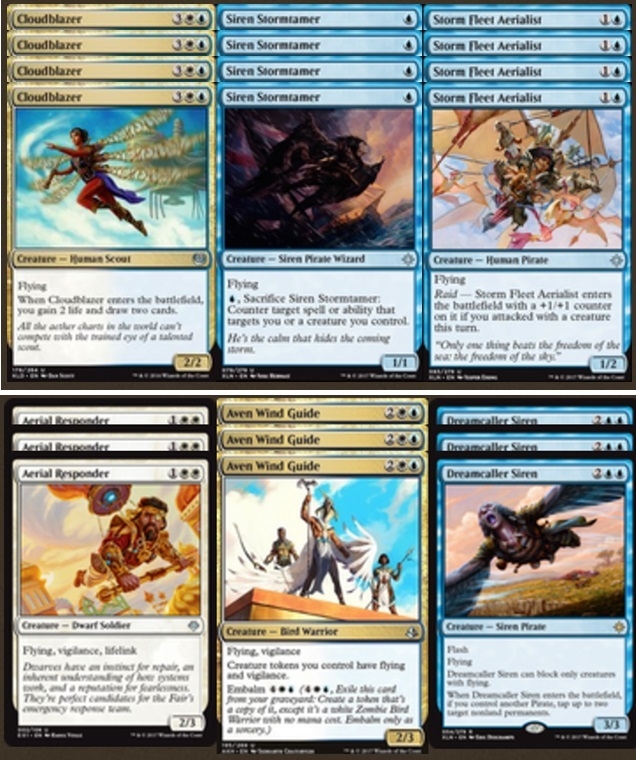 This list does pack some of the better flying creatures available in standard right now such as Glorybringer, or provides flyers as is the case with Whirler Virtuoso. We had very early on dismissed Maverick Thopterist as not being a rather good choice for standard play but may now be re-evaluating our hasty judgement. 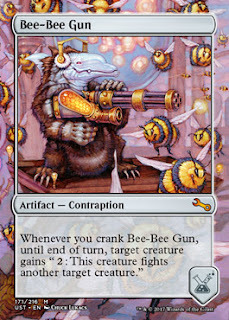 A 2/2 Artificer for five mana better have some good text. He does bring along two 1/1 Thopters and does more importantly have the 'Improvise' key word to assist in reducing that steep mana cost. Given the artifact sub-theme to this list, we should think that one would be able to play this on the cheap in most games. 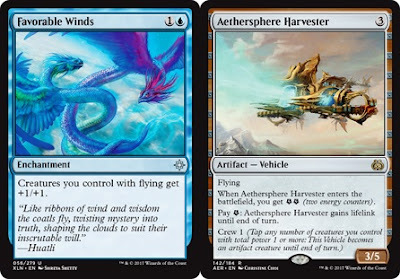 Supporting this are two important Vehicles - two Heart of Kiran and a full deck-set of four Aethersphere Harvester which provides the option to pay an energy to give it lifelink until end of turn. The blue one-drop Siren Stormtamer provides a level of assurance that protects more valuable assets and is a welcome card even late-game. 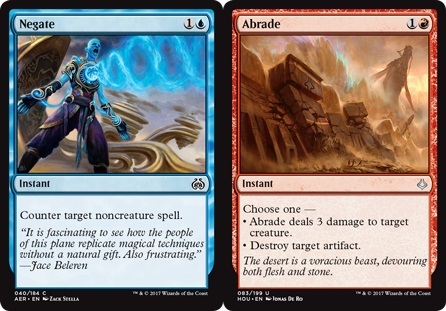 Two Pia Nalaar packs some utility to pump an artifact creature as well as some control to prevent an opponent's creature from blocking, which sounds like a good addition in this list. We had been fond of Hope of Ghirapur since it was previewed but have literally never seen anyone play this. Lightning Strike and Shock round out the list with some nice burn and in the sideboard two very decent inclusions are deck sets of Abrade and Negate, all of which seems to lend itself appropriately to a robust list. Looking forward to using this to build upon and modify slightly to personal taste and local metagame. 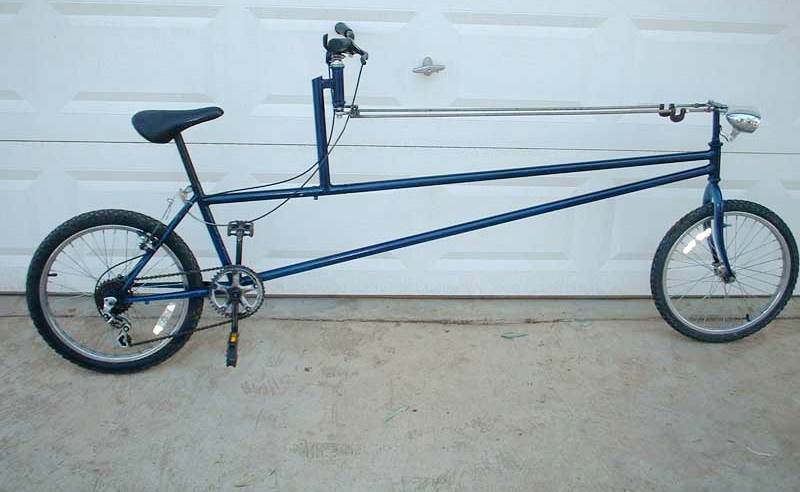 No - not that kind of cycle. A cycle in Magic: the Gathering is a collection of cards that have one or more relationships with one another, or share a common theme. 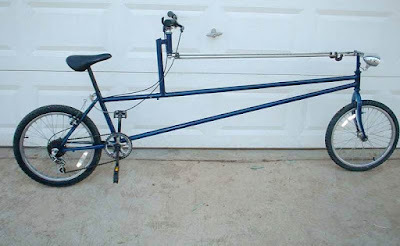 There are a number of types of cycles - vertical, horizontal, tight, loose, and more. Often the cycles are within the same set or block, but sometimes may stetch over and not necessarily through some blocks. A three-card cycle first started in 1998, leaping to 2004, and finally completing this year may be the longest stretch of time for Wizards of the Coast to complete a card cycle. Click on over to Gathering Magic for today's Unstable preview of the third and final Magic: the Gathering player psychograph. 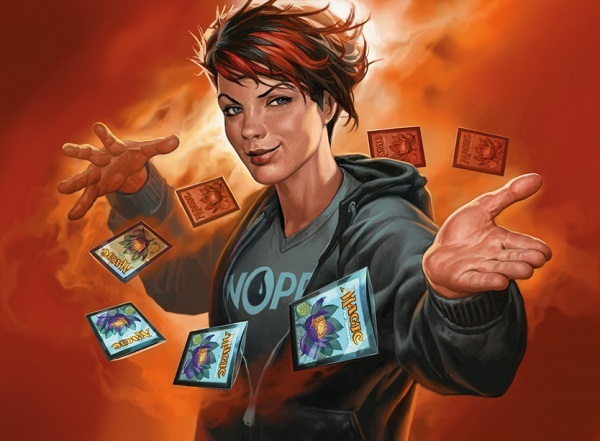 In an article by Mark Rosewater in 2013, he had indicated that there are three basic types of Magic players. The fancy term for these categories is "psychographic profiles." A psychographic profile separates players into categories based on their psychological make-up. The player types of Timmy, Johnny, and Spike. Johnny, Combo Player (Unhinged), illustrated by Kensuke Okabayashi, November, 2004. Johnny is the creative gamer to whom Magic is a form of self-expression. Johnny likes to win, but he wants to win with style. It’s very important to Johnny that he win on his own terms. As such, it's important to Johnny that he's using his own deck. Playing Magic is an opportunity for Johnny to show off his creativity. Spike is the competitive player. Spike plays to win. Spike enjoys winning. To accomplish this, Spike will play whatever the best deck is. Spike will copy decks off the Internet. Spike will borrow other players' decks. To Spike, the thrill of Magic is the adrenaline rush of competition. Spike enjoys the stimulation of outplaying the opponent and the glory of victory. Very long awaited but the day has finally arrived. The first day of previews of of the upcoming silver-bordered 'Un-Set' has finally arrived. Click on over to the Wizards of the Coast Magic: the Gathering site today to drink in all the nutty goodness. This set is preceded by 'Unglued' (August, 1998), and 'Unhinged' (November, 2004). These were fan favourites and a sense of nostalgia had only grown over the years since. 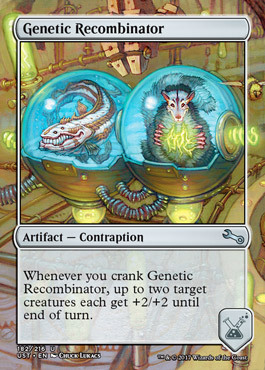 Returning to this set is a much discussed and highly popular mechanic ‘Contraption’. Specifically, this is an artifact subtype and associated with the assemble keyword action. 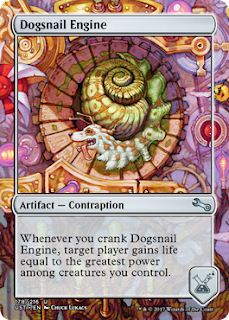 Steamflogger Boss from Future Sight (May, 2007) was the only card for years to have this until Unstable. Unstable looks to take this to quite another level and we suggest you read MTG Rules Miser Matt Takak’s article linked here about just how one may assemble a contraption. We will leave off for now, but here is a poster for the Crossbreed Labs showing a number of contraptions associated with that faction. 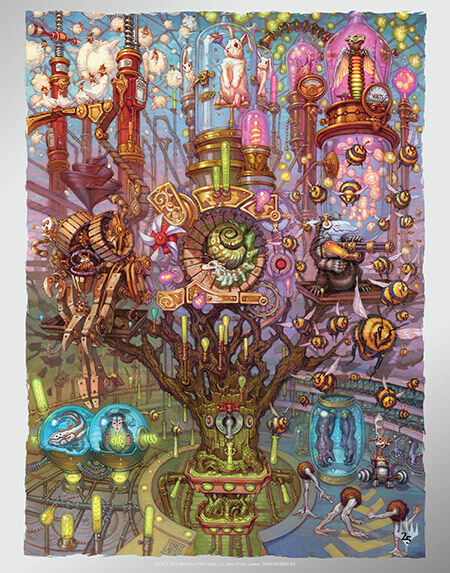 It appears that we have three of the possible nine contraptions accounted for within the awesome poster art now. 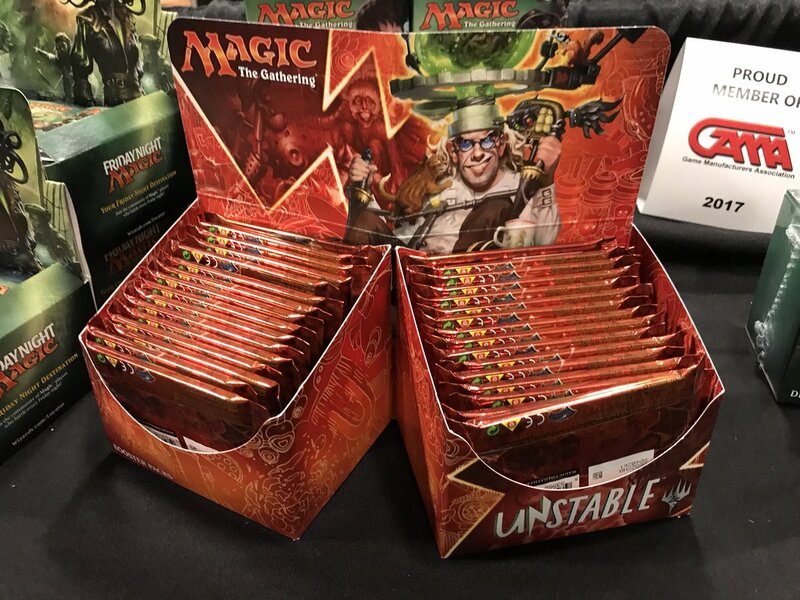 We were not playing Magic: the Gathering when the 'Un' sets (Unhinged / Unglued) and really did not develop a semblance of humour until just last week, so we are certainly looking very much forward to the release of the upcoming silver-bordered 'Unstable' set and all of its nutty goodness. The news here is that Ed Nguyen (store owner?) snapped a pic of an Unstable booster display box at the recent Southern Hobby toy expo in Nashville. Revel in these pixels ! 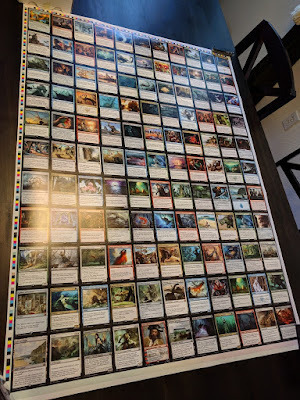 This MTG card and tile-based game promises to provide a out-of-the-box multiplayer Magic experience and is (quite obviously) closely related to the current Ixalan / Rivals of Ixalan card sets. 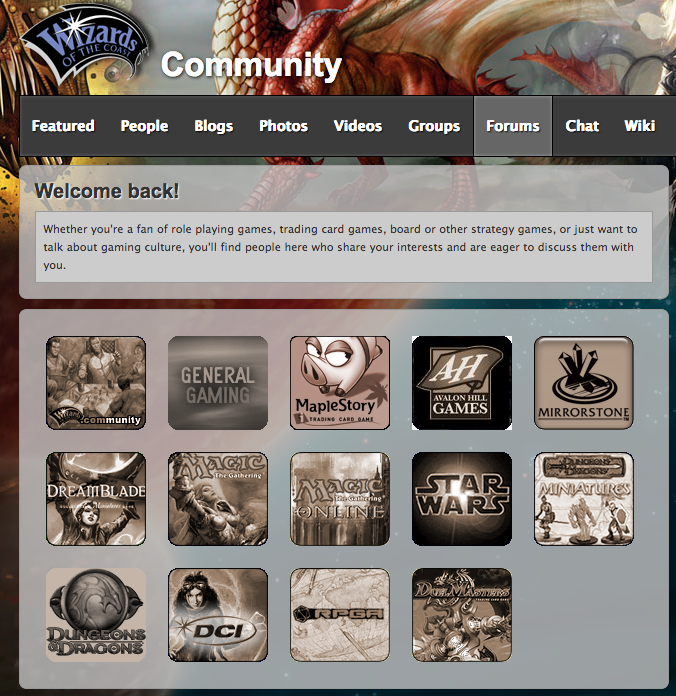 In fact, the decklists, linked in this section looks delicious and fun to play for our play-group. Of interest is a handful of cards printed in this set which received new card art. Highlighting that is one of our old favourites, 'Zealous Persecution', with cool new art from Sara Winters. 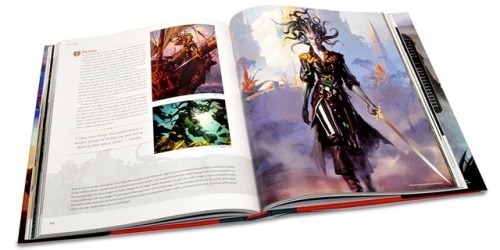 Speaking of Ixalan, be certain to drop by the mothersite today for Planeswalker's Guide to Ixalan, Part 2, linked right over here. In today's offering from the R&D Narrative Team, we are treated to more back story to how the Vampires of the Legion of Dusk came to be, and the flight of the ancestors of the Bazen Coalition fled seeking freedom. Lastly, some rather great humour developed over at Good Gamery lampooning the massive card leak a while back for Ixalan. One should start much the same way as we did - hearing about a Rivals of Ixalan leak with this post on Imgur, followed by the accompanying story at the Good Gamery site at this link. A whole lot of really great creative work went into this and we will be enjoying these witty creations for days to come. 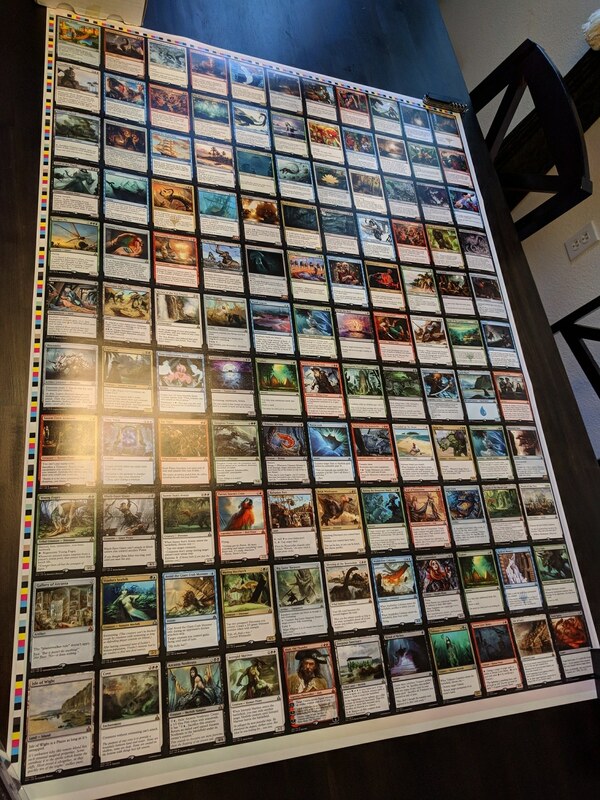 Here is the full visual spoiler in their Rivals of Ixalan gallery - linked right here. Our personal favourite - the rather naughty Mating Matriarch along with the great flavour text from our boy in green Garruk. Although the previous product was five clams more expensive, we felt this was great value. In comparision, we feel that we are just breaking even with no added incentive to pull out our wallet for this year's Gift Pack. A small modification such as alternate art for the foil Metalwork Colossus and Kari Zev, Skyship Raider - paired with her foil Ragavan monkey token, would have swayed our opinion. 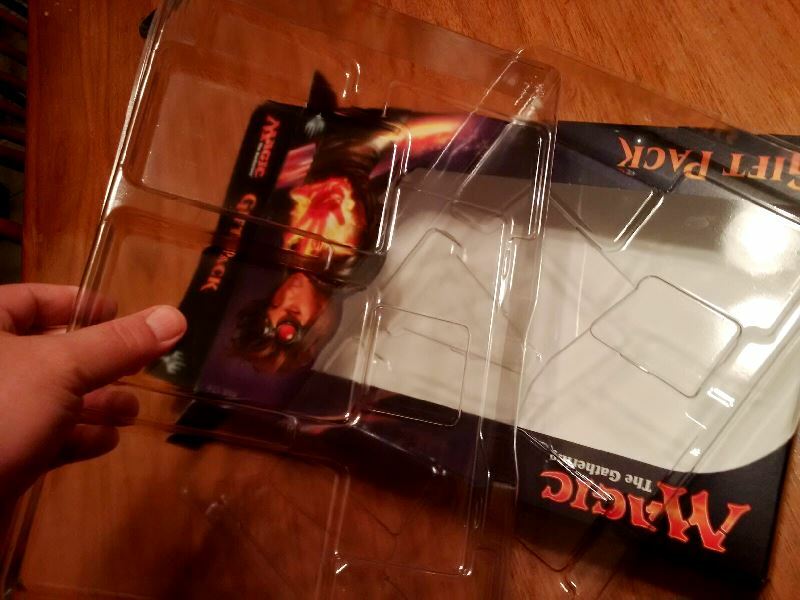 This product appears to have been designed specifically to be placed on a shelf in a big box store such as Walmart or Target alongside Yu-Gi-Oh product. There may exist a small chance that this Gift Pack may actually be mistaken for a Yu-Gi-Oh product by a parent, relative or friend resulting in a measure of disappointment during Christmas. 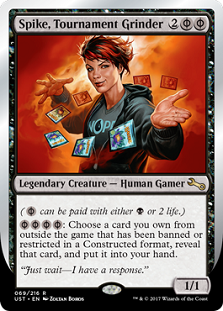 This is not to say that there are not Magic: the Gathering players out there who are indeed pleased with this - we have personally spoken with several who have or who intend to purchase this. Our final concern addresses the over-packaging, and carbon footprint of this product. We realist that there is a new president south of our border and that the protection of the environment is clearly not a priority. The fact that the Environmental Protection Agency has been seriously de-funded indicates that environmental protection is not even a consideration. A company such as Wizards of the Coast, using the resources of its parent company Hasbro is encouraged to stand out with environmental consideration being incorporated into the life cycle of their product and packaging, which they have to an extent, but certainly not with this product. 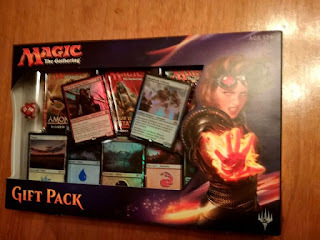 Should Wizards of the Coast realise some commercial success with this product, we would be delighted as we want to enjoy playing Magic: the Gathering for years to come.